1st: Dice the red onion and gently fry until translucent. Set aside to cool. 2nd: Mix the beef mince, a handful of grated cheese (I used Edam but Parmesan would work just as well – take care when seasoning as Parmesan can be salty) and breadcrumbs, a beaten egg, a dash of Worcester Sauce and seasoning. Once the onion has cooled mix this into the rest of the ingredients. Using your hands is best as this ensures that everything mixes properly. 3rd: Divide the mixture into four and shape them into cricket ball sized burgers. Leaving them round shows that they are not shop bought but flatten them slightly should you wish. Place onto an oiled tray and place in the fridge to firm up. 4th: After approx 20mins remove them from the fridge and fry in butter for 3mins per side. Should you like them more well-done cook them for longer or cook them further in the oven. 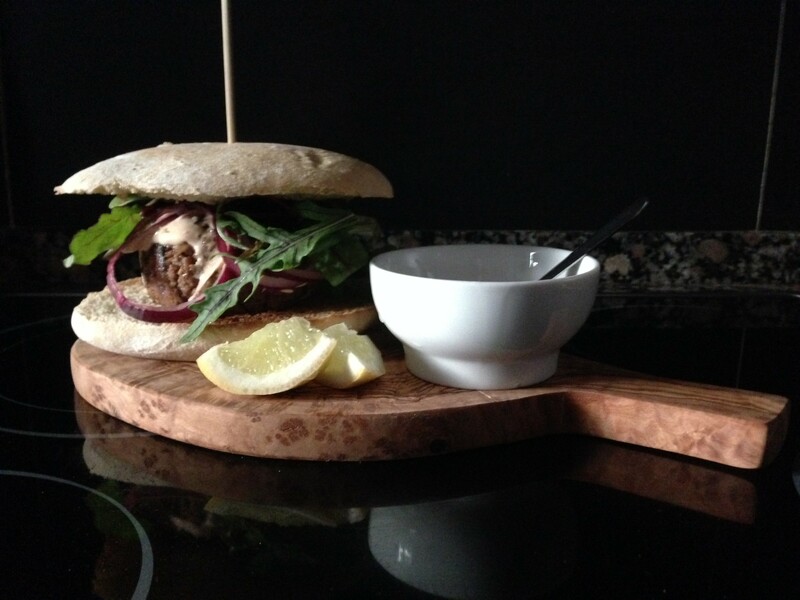 5th: Put them into a toasted bap of your choice with salad leaved, onion rings and your favourite sauce. I made a spiced mayo to go with my burger using mayonnaise, ketchup, lemon juice, tabasco sauce and cayenne pepper. Make this as spicy as you wish. I was privileged to eat one of these burgers just last night. I think that what really surprised me was how quickly rob put it all together and had it ready to throw on the BBQ. WOW, juicy, crunchy and absolutely delicious. I think these burgers will become standard at my kitchen and I can’t wait to make them myself!